A suicide bomber has struck Kabul's most famous shopping district, Chicken Street, injuring seven people. Three international peacekeepers are among the wounded and are believed to have been the target of the attack. The BBC's Andrew North, at the scene, says the attack happened at about 1530 local time (1100 GMT) and that the bomber's body was lying in the street. A spokesman for the hard-line Islamic Taleban movement has said it was behind the attack. A spokesman for the Nato-led multinational force in Kabul said one of the peacekeepers was seriously hurt. He gave no further details on their nationality or gender. It is the first suicide bombing in the Afghan capital since January, our correspondent says. "The Taleban takes responsibility for the suicide attack in Kabul... We plan more attacks," spokesman Mufti Latifullah Hakimi told Reuters news agency. Witnesses say a man approached several soldiers who had parked their vehicle outside a carpet shop. He then detonated several hand grenades he was carrying, killing himself in the blast. 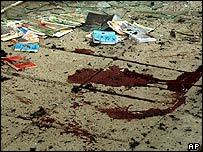 The ground and the carpet shop were spattered with blood. A reporter for the Associated Press news agency saw police retrieve a tattered sleeve still containing the attacker's arm from across the road. The man's body lay next to a vehicle bearing the insignia of the Nato security force, he said. The engine of the vehicle was still running, but its rear window was blown out and its front tires were flat. There were also several unexploded hand grenades lying in the street, apparently sent flying by the blast. The fear is that this marks the start of new campaign of violence in Kabul by anti-government militants, after the relatively peaceful presidential elections two weeks ago, our correspondent says. Just over three-quarters of the votes nationwide have so far been counted. The incumbent President, Hamid Karzai, is well ahead of his rivals in the returns so far received.